The RRD team has come up with a new complete collection of Harnesses designed specifically for each different program of use for this season. Each kite model was designed to accommodate the specific needs of different types of riders. The Sense is specifically designed for women and girls. It is a waist harness built using an anatomic design, which perfectly wraps around the body to offer a high level of support and comfort. 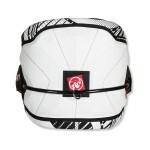 It is perfect for multiple styles, such as freestyle, wave and freeride. The Sense features a soft EVA and Neoprene interior which makes it very comfortable. The flatter lower back section improves support, without affecting the rider’s freedom of movement. The interior structure is designed to spread the kite pull force without creating pressure points on the body. A P-pre-shaped internal plate reinforced with fiberglass battens makes the kite robust and assures a solid, yet comfortable waist enclosure.